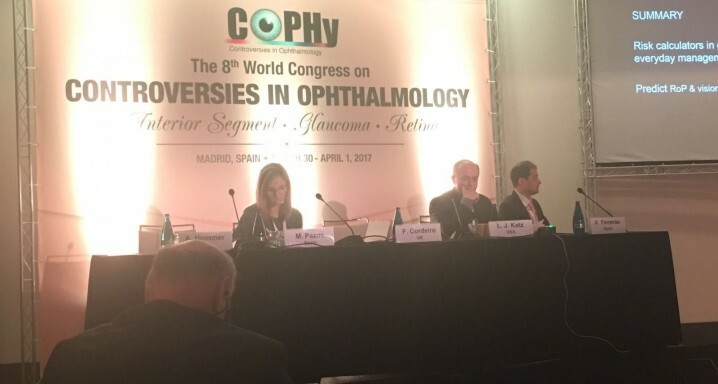 Dr. Marta Pazos moderated the first round-table discussion devoted to glaucoma diagnosis at the 8th World Congress in Controversies in Ophthalmology (COPHy) in Madrid last weekend. During the session, she advocated the value of the image of the anterior segment in the diagnosis of patients suspected of suffering narrow-angle glaucoma in a debate with Dr. L. Jay Katz, who argued the opposite view. At the second round table, moderated by Dr. Katz and Dr. Antonio Ferreras, Dr. Pazos argued against prophylactic surgery to prevent narrow-angle glaucoma. Dr. Katz made a case for its benefits. The COPHy congresses promote debates and discussions about specific topics related to ophthalmology, based on scientific evidence. Its sessions involve one-on-one encounters where experts are asked to argue the pros and cons of each issue by employing their own experience and the latest objective data at the disposal of the scientific community.